Child Life Specialists work with children to minimize the stress children can feel during hospital stays or visits to the Emergency Room or Day Surgery. This work is crucial to a child’s emotional health, because medical settings can be a new, unfamiliar world for children-with the potential for them to develop fears and misconceptions. Child Life Specialists use many techniques to help a child adjust to the hospital and to maintain a normal lifestyle. A child who feels “at home” is less anxious and may recover more quickly. Certified Child Life Specialists are trained in child development and specialize in working with children in health care settings. They address the child’s need to understand and cope emotionally with the medical experience. Play is the cornerstone of expression in childhood and a normal part ofeveryday life. 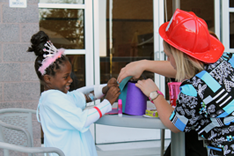 The Child Life Specialists provide opportunities and appropriate toysand activities to encourage childrento play. Often through play, a childcan relax enough to express feelings or fears about medical experiences. Child Life Specialists maintain specially-equipped playrooms thatare safe, stress-free places for patients to play. Teach relaxation and mental imagery techniques to help children control pain, deal with anxiety, or cope with medical procedures. Provide support for a patient’s siblings.